Just look at that title! Don’t worry, I’m not going to start quoting sonnets at you. There’s just time before the Master of The House returns from his travels (he’s at the airport) and the week’s ‘Writing Retreat’ is over (hurrah! ), to write a few lines about Shakespeare. 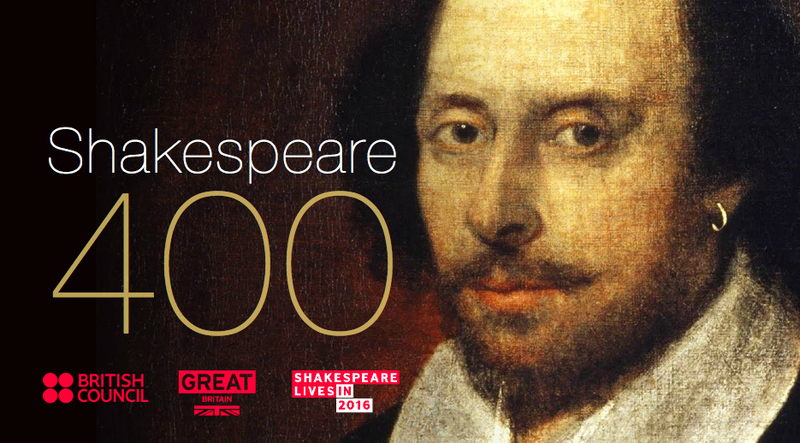 You’ve probably seen it on the news: today is the 400th anniversary of Shakespeare’s death and, if records are to be believed, 23rd April was also his birthday! Let’s hope he got to eat some cake and blow out the candles before he pegged it. I live near to Stratford-on-Avon but I’ve avoided it today, even though there are lots of celebrations and events (and fireworks tonight over the River!) because it would just have been too MANIC! but I thought I’d offer my own humble little tribute to The Bard. Please feel free to comment with your own experiences – good or bad – of Mr W Shakespeare. 1. It was my mum that first made me realise Shakespeare was A Good Thing. When she was about the same age I am now, she did a day class in which she studied lots of his plays and they went to see some of them at Stratford. She always came back raving about what a great evening she’d had – how, for example, ‘real’ snow had fallen on the stage. She made it sound magical. 2. My ‘O’ level (yes, I’m that old) Shakespearean play was Henry V and I still love it. In fact I saw this production at the RSC last October and it was one of the best plays I’ve ever seen. 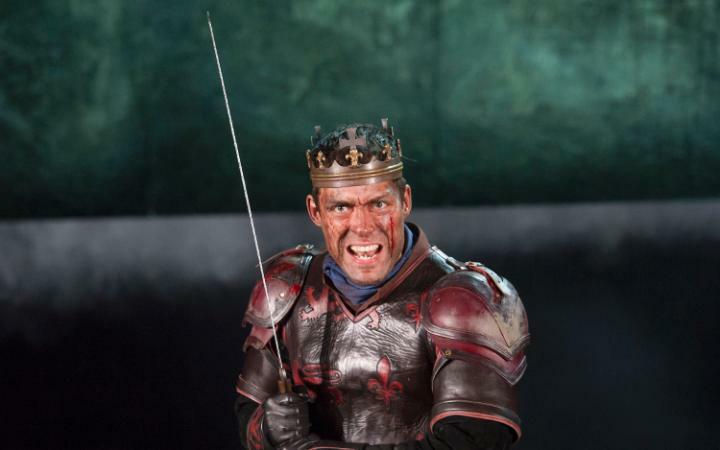 They made it funny and Alex Hassell (yum), made a brilliant King. 3. Our teacher for English ‘O’ level was Mr Lorden. He was scary. He made us learn the first chorus of Henry V off by heart, for homework. ‘Oh for a muse of fire that would ascend the brightest heaven of invention…’ (is how it starts). I can still remember it now. When we got to the class the following week, he asked a few people to recite it and no-one could. He was not impressed, shouted at us all and we moved on to something else. I was burning up inside because I HAD learned it – I knew it! But I was too embarrassed to put my hand up. The thought of saying it in front of the whole class (I’d have gone scarlet) was too much. I can still feel that disappointment… ! 4. Our teacher for ‘A’ level English (eek, I’m ashamed to say I can’t remember his name), took us to Stratford a few times in a mini bus to see some RSC plays. We only had the cheapest seats – way up in the Gods! But it was still a great experience and I’ll always remember seeing Titus Andronicus. That’s one heck of a gory play, in case you haven’t seen it. Hands and tongues get cut off and people have to eat their own children… ! Members of the audience got up and went out. I can only assume because they felt sick! Or maybe they wanted a choc ice. 4. In my first term at University my new friend Wendy and I got tickets to see Coriolanus at Leeds Town Hall because we’d both done it for ‘A’ level (what a couple of keenies, eh? Everyone else was probably on a pub crawl and there we were, going to see Shakespeare!). There was snow on the ground and a bus strike and half the cast hadn’t been able to get there so various people stood in, reading their parts from scripts in broad Yorkshire accents, bless ’em. It was one of the funniest things I’ve ever seen. Thirty – ahem – years on, we still talk about it. 5. And of course, as you know, Shakespeare spoke loik a Brummie. And as a Brummie myself, that’s something to be proud of. This entry was posted in Plays and tagged Shakespeare; Stratford. Bookmark the permalink. I’m loving the Shakespeare fest. Your Coriolanus story about the audience pitching in would make a great short story, Helen, if you haven’t already written it! Hmm, hadn’t thought of that Tracy (sometimes you need kind people to point these things out to you!). Definitely one to think about – and work on. Thank you for the idea! I’m enjoying all the Shakespeare celebrations on TV and indulged in relevant memories on my blog! Ooh, I will pop over to your blog and have a look, Rosemary! I haven’t watched the Shakespeare celebrations yet but I will see them on ‘catch-up’. Looking forward to indulging! When we first moved to this area, the RSC came to Corby to do some shows in a town school. We went to see The Crucible (Arthur Miller, I know, not the Bard). The performance was in the round, actually on the floor of the sports hall, so the audience had to stand up and shutffle about as the action moved. One chap in front of me decided it would be a good idea to sit down on the floor, cross-legged. Unfortunately, by the time the scene ended his legs had gone to sleep, and two members of the cast had to manhandle him out of the way, picking him up under his arms with his legs still crossed! that made me laugh, Julia – I can just see it! I bet he was mortified and I don’t suppose the actors were too impressed! But perhaps they’re used to things ‘going wrong’ like that – especially where the general public are concerned! (I love Arthur Miller, by the way. The RSC seems to do a lot of his stuff). Loved Shakespeare since I was forced to study MSND at the age of 11. Now 68 I last year completed my OU Lit Degree with a module on – Shakespeare. (Coriolanus is a really bad play though (in my opinion). Ooh, no, I don’t agree with you there! (About Coriolanus!) Although I must admit, all these years later I can’t remember much about it – unlike the other play I studied for A Level English – The Winter’s Tale – which was fab. I did enjoy Coriolanus though but agree that it’s not one of ‘the best’!